(Sale, London, Sotheby's, 13 July 1937, lot 64); (sale, London, Sotheby's, 15-17 November 1937, lot 546); (sale, London, Maggs Bros., Ltd., catalogue 709, 1941, no. 30); (purchased by William H. Schab Gallery via Paul Graupe); purchased by Ian Woodner, New York, by 1973; by inheritance to his daughters, Andrea and Dian Woodner, New York, 1990. French Books and Prints, Incunabula, Bibles and Bindings. Maggs Brothers, London, 1941, no. 30. Woodner Collection II: Old Master Drawings from the XV to the XVIII Century, William H. Schab Gallery, New York and tour, 1973-74, no. 2 (illustrated). Butler, Joseph T. "Old Master Drawings from the Woodner Collection II." Connoisseur 186 (1974): 56-57. Massing, Jean Michel. "The Influence of Erasmus: Text and image in a French pre-emblematic manuscript." Manuscripts in the Fifty Years after the Invention of Printing (Colloquium Paper at the Warburg Institute) 1983: 75-82. Massing, Jean Michel. "The Illustrations of Lucian's Imago Vitae Aulicae." Journal of the Warburg and Courtauld Institutes. 50 (1987): 215-16. Massing, Jean Michel. Du texte à l'image. La Calomnie d'Apelle et son iconographie. Strasbourg, 1990: 48, 67, 81, 93, 284-285, no. 8A, pl. 8A. Colenbrander, H.Th. "Een serie tekeningen naar Erasmus' Adagia: Jean Perréal, de Maître aux Pieds-Bots en de Meester van de Legende van de H. Egidius." in Boeken in de late Middeleeuwen. Hermans and van der Hoek, eds. Groningen, 1994: 211-220, repr212. Massing, Jean Michel. Erasmian Wit and Proverbial Wisdom. 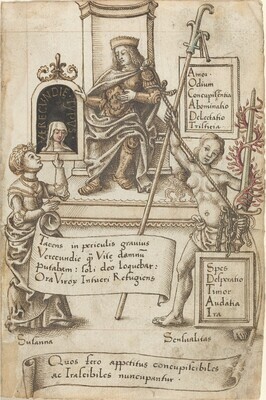 An Illustrated Moral Compendium for François 1er. Unpublished manuscript, 1994.